Over 70 young clergy women from all over the world gathered in Nashville last week for the sixth Young Clergywomen Conference. High lights include our wonderful speaker, Dr. Nyasha Junior; worship that was at turns beautiful, real, well-planned, and spontaneous; our first time providing on-site childcare; and, of course, fun and bonding with fellow young clergywomen. After you see these pictures, we know you’ll want to mark your calendar: our next conference will be held the week of July 6-10 in Minneapolis, MN. Photos provided by Kelly Boubel-Shriver; Sarah Kinney Gaventa; Nyasha Junior; Julie Jensen; Elizabeth Grasham-Reeves; Kerry Waller Dueholm; and Jessica Herren. Even before the conference, the fellowship begins. A group of YCWs from Sweden road-tripped with two American YCWs from Pennsylvania, and stopped at the home of another YCW in Virginia. A central worship space for the conference, with objects reminding us of our identity, made in God’s image. Our conference presenter, Nyasha Junior. Close attention to our presenter. A prayer table allows participants to pray for each other throughout the conference. Our first ever on-site conference childcare allowed women with young children to attend, many assisted by wonderful partners. An ambitious group of YCWs gather for a little extra-curricular Zumba during the conference. 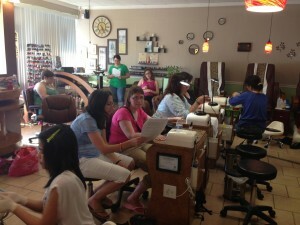 The unexpected occurs: a worship service in a nail salon, including manicures and pedicures. Old friends meet new babies. This is what 70-odd young women clergy look like. https://youngclergywomen.myworshiptimes31.com/wp-content/uploads/sites/3/2013/07/image10.jpg 680 1024 Members of the Young Clergywomen Project https://youngclergywomen.myworshiptimes31.com/wp-content/uploads/sites/3/2017/05/YCWILogo_Vert_Black-300x229.png Members of the Young Clergywomen Project2013-08-01 02:00:122018-11-13 11:45:03Images from "In Whose Image?" Thank you again for inviting me to share with you. I enjoyed meeting you in Nashville.